The studio space for the Wahab Shah Dance Company is not very easy to find. 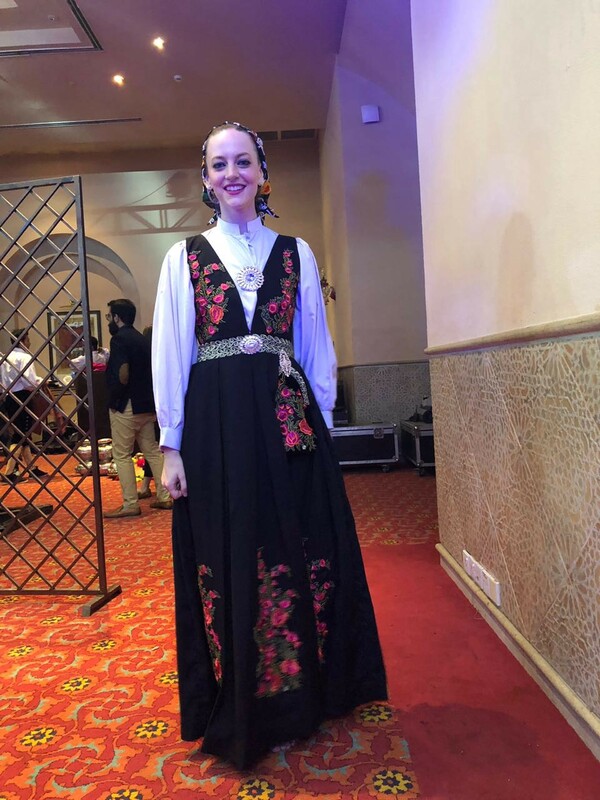 I was called to rehearsals to join the troupe performing Norwegian folk dance for a conference in Islamabad, and besides the initial “what the hell? ?”, I thought it seemed like a great idea. I researched the address as much as possible, though addresses and google maps do not seem to get along very well here. I asked the manager to describe it, and he did, and yet still when the Careem dropped me in the middle of a bustling market I had to call and have him talk me through the way. With him on the phone, I found the right alley and the staircase hidden behind, to the door behind the carpet hanging on the wall, and then finally, the studio behind. While I knew one of the dancers already from my performance with Adnan, it was again a new universe. The women arrived in full coverings from head to toe, and once inside, were quick to remove headscarves and the long flowing overdresses, revealing jeans and T-shirts underneath. The choreographer spoke English, but mostly the others didn’t. As usual, the first day was somewhat awkward, both me and them still working out how to deal with each other. At least one thing had carried over from my last performance — somehow the word had passed that I do good warmups and stretches, and within ten minutes, I was asked to lead a warmup. That weekend, I commuted every day from Harsukh, where I was teaching workshops in the afternoon, to the studio, and back again. The contrast was striking : the peace and serenity of Harsukh, where Bina Jawwad (a kathak master) and her daughters dedicate their time to their craft, where the food is all organic, the dance hall has a sweeping high ceiling and wood floors, and I was the teacher. And then, the studio, where I was just one of the dancers, just steps from a bustling market full of smells and sights and sounds, the bantering and laughter of the dancers, slowly opening up to me. They couldn’t have been more different, and yet both, in their own ways, felt like home. As it turns out, Norwegian folk dance is quite easy, but the music is challenging, as the beats aren’t clear, and half the song we used was in 10, not the usual 8. My partner for the song was the dancer I had met before, and turned out to have the kind of dancer soul I always appreciate — the people who never stop moving or practicing, constantly trying new things, playing around with movement, the people who are visibly happier when they move. He spoke little to no English, but we got along perfectly. I enjoy teaching most of the time, especially when it’s something I’m passionate about. But at several points during the weekend, I felt happiest when I was just one of the dancers, 7 Pakistanis and 1 me, rehearsing for this folk dance. I caught myself feeling incredibly grateful that I’m not just a teacher. That I’m not here just to “impart knowledge,” because while I think I can share some interesting experience, what I most appreciate is being able to share the stage with the local dancers, exist as equals and partners. Over the weekend, the strangeness and awkwardness quickly fell away. I proved that I contributed positively, and that seemed to be enough. Even by Monday, when the whole group came together to show the 8 different dances we would be performing, the total over 20 dancers, I was treated as part of the group. Even if we weren’t already friendly by the time we left to Islamabad, though, it’s hard to remain strangers when you sleep in a bus, stick together all day, share a stage, sleep in a bus again, and then share the few pillows to curl up on a concrete floor at the studio when you arrive at 4:30am. At that point, even if you never see each other again, you’ve bonded. In many ways, the belonging I felt during the trip was a stark contrast to the Residency program I’d done the week before. Sponsored by ASSITEJ Pakistan, the Next Generation Program was an odd mix of conference and residency, somewhat awkwardly facilitated in such a way that it felt often like we were in school and being scolded by the teachers. There were two clear versions of participants — the local Pakistani artists, who were charged for their participation and given communal rooms, and the international arts, who were given top security and two-bed rooms. Of the 10 international artists, I don’t think any had been to Asia before, and flew in specially for the program. Essentially, I fit with neither, and it was hard to find a place. I was trying to work at the same time, continue building my life in Lahore, and I found myself outside the deep bonds that the participants formed with each other. We were assigned groups for a final show, and mine managed to have all the people who came late, were injured, had strong opinions, or were not particularly interested in and/or didn’t have any experience in collaborating. In many ways, I think it was good, because it was challenging, and you always learn more that way. It was, however, draining, and even a beautiful 2-day wellbeing retreat after wasn’t quite enough to shake off the intense, stressed energy the Residency gave me. In part, I think it was also that I was the only dancer at the residency, and the program was technically supposed to focus on children’s theatre (which it did only marginally). It’s not that I didn’t connect with anyone, it’s just that I didn’t feel at any point during the six days like I really belonged. It was raining after the performance was over in Islamabad. I’d spent the day learning Punjabi Bhangra and watching the rehearsals, getting my picture taken hundreds of times, and holding my dance partner up as we navigated a ridiculously slippery stage. While waiting outside for the bus to come, my dance partner turned to me and said, “Let’s run.” And we did, blasting into the rain and shouting, making airplane arms. The rain spattered down, and we made the circle several more times. It was something beyond language, beyond words, beyond cultures or background. There was no stress, no trying to understand, no misunderstandings or questions. I’m not sure the last time I felt so uncomplicatedly happy. In a Norwegian traditional folk outfit for the performance! Stay tuned for more thoughts and updates from Lahore!